With Valentine’s Day coming up on Thursday, we’d like to take this opportunity to remind Canadian business owners that gift-shopping will be a top priority for many consumers over the next few days. Last week, our blog highlighted the fact that gift cards do indeed make good Valentine’s Day gifts. As a result, retailers should stock up on them to maximize sales before the big day! It’s important to remember, however, that Valentine’s Day is far from the only day of the year that inspires the purchasing of gifts. We all know how huge the holiday shopping season is. But consider the fact that couples all over the world have very special days of their own to celebrate: anniversaries. Wedding anniversaries and anniversaries that mark the dates relationships began are celebrated all year round. So do gift cards make good anniversary gifts? It’s all about making your partner feel special. Of course, gift cards make good anniversary gifts! Naturally, a great gift card purchase is one that keeps a partner’s needs, wants and interests in mind. Grabbing any old gift card won’t exactly showcase the thoughtfulness that gift-giving is known for. 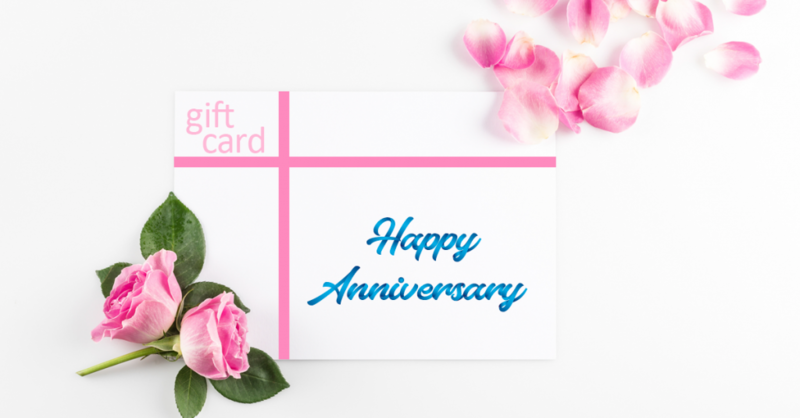 Anniversaries are special days so the way in which you give a gift card to your partner should be special as well. Practical can still be sentimental. According to GiftCards.com, the idea that gift cards lack sentimentality is nonsense. The website agrees that the way in which a person provides a gift to his/her partner is what makes the gesture truly special. The site goes on to offer an excellent suggestion about accompanying the gift card with a “Best Decision Ever” message to drive home the deepness of one’s devotion to his/her partner. “Upload a photo of the two of you on your wedding day, and turn the image into a personalized gift card,” recommends GiftCards.com, “Write ‘Best decision ever’ on the card’s embossed message line. Upload a current photo to buy a personalized greeting card to go with it…Write a list of good decisions you’ve made over the years…Put it all together and your honey will see that, of all the good decisions you’ve made, choosing him or her was the best. Valentine’s Day is also an anniversary date for many couples. Make no mistake about it. There are many couples who either got engaged or started their relationships on Valentine’s Day. It’s a big week for gift card sales. If your retail business is yet to get in on the action, please don’t hesitate to contact Canadian POS! Our electronic gift cards have long been known to encourage repeat business, attract new customers and boost sales all year long. Give us a call at 1-877-748-2884 or email us at info@cdnpos.com.